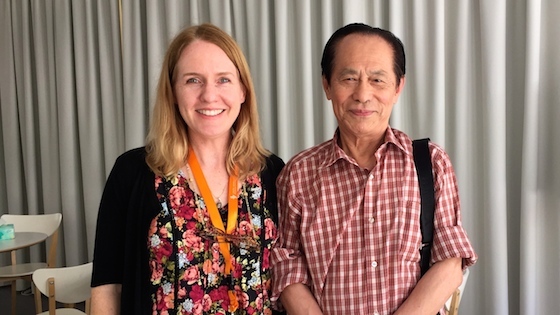 August 24, 2016, 9:17 AM · SHANGHAI -- I knew that I would hear a lot of The Butterfly Lovers Violin Concerto today in Shanghai, but I had no idea that I'd meet one of the composers of the piece, Zhanhao He, who is now 83 years old. All 18 semi-finalists in the Shanghai Isaac Stern International Violin Competition are required to play the "Butterfly Lovers" concerto, a piece that was written in the 1950s and has gained popularity for its East-meets-West aesthetic. Nine students played on Wednesday at Shanghai Symphony Hall's Chamber Hall, and another nine will play on Thursday. Additionally, each violinist is required to play a Romantic-era sonata. No pressure here, with the composer sitting in the audience, and also the violinist who premiered the piece, Lina Yu, sitting on the jury! "The Butterfly Lovers" Violin Concerto was written in 1959 by Zhanhao and Gang Chen while they -- and Lina Yu -- were students at the Shanghai Conservatory of Music. A group of students actually set out to write a piece for violin that would be of interest to the Chinese people. Zhanhao explained to me today that back then, violin students were always playing Western music, and while "Chinese people thought Western music was beautiful, it was hard to understand." It was a musical language that simply was not familiar to the Chinese ear. For this concerto, they wanted to use Chinese elements -- a pentatonic scale, traditional Chinese melodies, and the Chinese legend of the Butterfly Lovers -- to give the music greater appeal to a Chinese audience. Laurie with Zhanhao He, a composer of "The Butterfly Lovers" Violin Concerto. 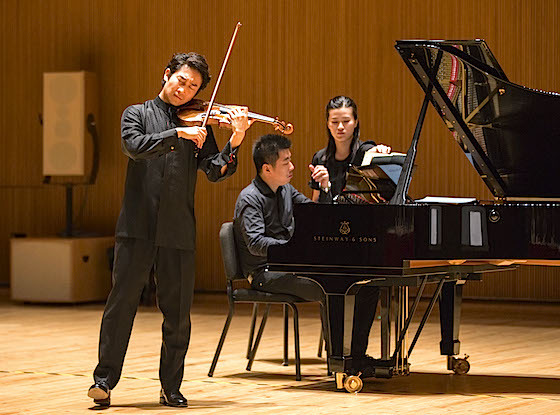 "This violin concerto was based on Shaoxing Opera, so it was easier to understand it," Zhanhao said. The story involves star-crossed young lovers who, after meeting their tragic, Romeo-and-Juliet-like fate (death! ), emerge in spirit as two butterflies, never to be parted. Zhanbao started learning the violin at age 17 and helped write the piece when in his 20s, he said. Zhanhao was actually the first to try playing the piece while it was being composed and before Yu performed it; though he admits, "I couldn't play what I wrote!" The violinists at the Shanghai competition certainly could. (Listen to the live stream and find archived performances by clicking here.) The piece comes off very impressive and virtuosic; and that made me wonder, how playable is it? Toward the end of the day, I found myself sitting next to a group of students who were shuffling a lot of violin music in their laps. When I looked over with interest (as I can't speak Chinese! ), one of them gave me a big smile and scooted the the sheet music for "The Butterfly Lovers" concerto my way, so that I could see. It is actually quite playable, but the challenge is to embody its Chinese idiom: to pace the story, capture the sound of the language (the music literally mimics the sound of the Chinese language inflection, to my ear) and the feeling of the traditional music. The competition is taking place at the Shanghai Symphony Hall, which was opened just two years ago, in Sept. 2014. Here are a number of impressions from today, both in the various performances of the Butterfly Lovers concerto and of the violin sonatas by different composers. Xiao Wang of China helped me remember why I love the violin with his Schumann Sonata No. 1, which he played with great energy and presence in every note. I don't always notice right-hand expression, but I certainly did here; the bow always seemed to have intention. Yiliang Jiang, also of China (but studying at the New England Conservatory with Donald Weilerstein) played a well-shaped Kreutzer Sonata (Beethoven No. 9), with elegance and precision, and so satisfyingly in-tune in the upper reaches. He captured the mercurial nature of Beethoven with good dynamic contrast. Ji Won Song of South Korea (another NEC student of Weilerstein and Soovin Kim) showed mastery of the music and no fear of speed; in her musical gestures in the Butterly Lovers captured the sound of the language, though the story felt a bit hurried. Yang Zhang of China, a student of Lina Yu's, found more repose in the piece, and many flavors of drama, but it was marred by little misses. Maya Kishima of Japan, a former student of Zakhar Bron, played with almost overwhelming physical intensity, alternating with occasions of detached execution. She played with a 1700 Strad, which she used especially well at the end of the Butterfly Lovers, where a very high melody slides around beautifully and eventually lands on a harmonic -- those butterflies flying away. Yu-Ting Chen of Taiwan, a student at the Curtis Institute, played the Butterfly Lovers concerto with grace and elegant execution. She coaxed some gorgeous music from her violin in Brahms' Sonata in D minor, with pianist Yinglia Zue (who teaches at the Shanghai Conservatory) an absolutely steady partner. There was just no murkiness or rhythmic ambiguity in this piece; when two beats went against three, they simply fit. Still-life at Shanghai Strings: these are miniatures of all the stages in the making of a violin. 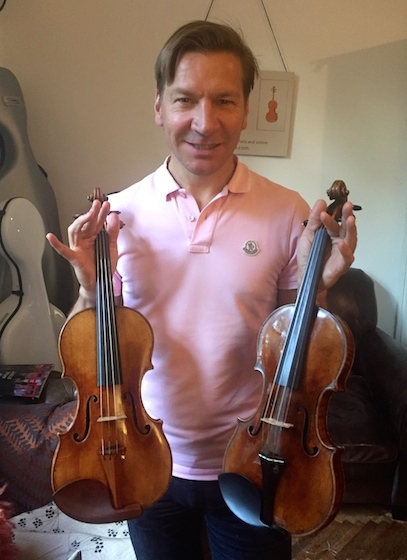 Florian Leonard holds the 1690 "Stevens" Strad right, and 1735 "David-Midori" Del Gesú, left. I'll be writing from Shanghai for the next few weeks; visit Violinist.com for more tomorrow! August 25, 2016 at 03:38 AM · Love the report, thanks. I have spent many happy hours hanging out at Christian Zenz's atelier - he's a mensch. Really sad I couldn't make it to this competition so I greatly appreciate your report! August 25, 2016 at 02:23 PM · It's a cozy place! I hope to explore more of the music stores here, there seem to be many right around the new Symphony Hall. Also I'd like to get a look at the Shanghai Conservatory! August 25, 2016 at 06:41 PM · Don't go to violin shops. They will drive you crazy! Seriously, Shanghai has more violin shops than you can see them all in one week. I gave up after looked a few during my last trip in April. August 27, 2016 at 05:04 AM · "It is actually quite playable," well, what you expect then? August 28, 2016 at 05:57 PM · It's not Paganini, it's got a wider number of people who will be able to play it.